The New England Patriots won Super Bowl LIII with a 13-3 victory over the Los Angeles Rams. And after three quarters of painfully-slow play and a fourth-quarter touchdown, we finally got the long-awaited answer to one of the most popular Super Bowl prop bets in the country. What Color was the Super Bowl Gatorade Shower? 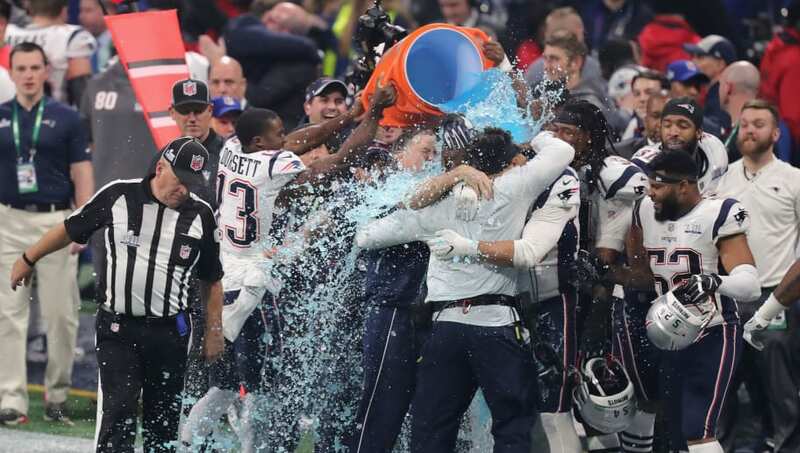 After the Patriots secured their sixth Super Bowl title, players snuck up behind coach Bill Belichick and drenched him with blue Gatorade. The odds for blue were +450 on FanDuel Sportsbook. ​​Despite oddsmakers like FanDuel Sportsbook backing a clear-colored Gatorade as the betting favorite, the Patriots Gatorade container revealed a blue result to this prop bet and bettors on that color rejoiced. What will be the first Gatorade color dunked over the winning coach? But now that we know what the answer was, you can't help but think how this prop bet may have been affected if the Rams won instead of the Patriots, and which color Gatorade was sitting in LA's sideline coolers? Either way, you have to give credit to Patriots and their win over the Rams as they are already the betting favorites to repeat as next year's NFL champion in Super Bowl 54, via FanDuel Sportsbook.